Tim Cox Artist Hand-Signed and Numbered Limited Edition Print:"Storm On The Mountain"
Medium / Edition: Limited Edition; Paper and Canvas editions. COA included. About the Artist: Endless nights of painting until dawn are finally paying off for Tim Cox. He is one of the best known western artists, having been voted into the U. S. Art Magazine�s Print Hall of Fame - 2000. Dozens of his Limited Edition Prints have sold out through the years - some as quickly as 3 weeks. Sales of his popular calendar line which started in 1986 have exceeded four million to date. One of the best compliments paid to his calendars is that you often see his tear off style calendars complete, late in the year. People will lift off the pages to find the date rather than tear them off! 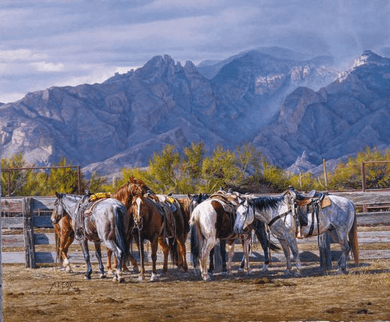 Tim's paintings have appeared on over 110 magazine covers through the years, and he has been featured in articles in at least 16 different publications, including Southwest Art, Western Horseman, Art of the West, American Cowboy and Beef. No thank you, I just want the 20x24 unframed SN print.